When training we mainly focus on biceps and triceps, but you’re missing out! Training shoulders means your physique will make drastic changes and complete your aesthetic look. Shoulders are a must, as they aid your strength and also assist your postural movements. A great pair of shoulders will help you to look wider and add mass to your arms, increasing definition and aesthetics. Having bigger and prominent shoulders will help increase your strength in other movements to help your overall progress in the gym. Try to implement these shoulder exercises to stimulate serious growth and create your 3D shoulders. Heavy compound exercises incorporate several working muscles and are one of the best ways to increase strength and muscle hypertrophy. 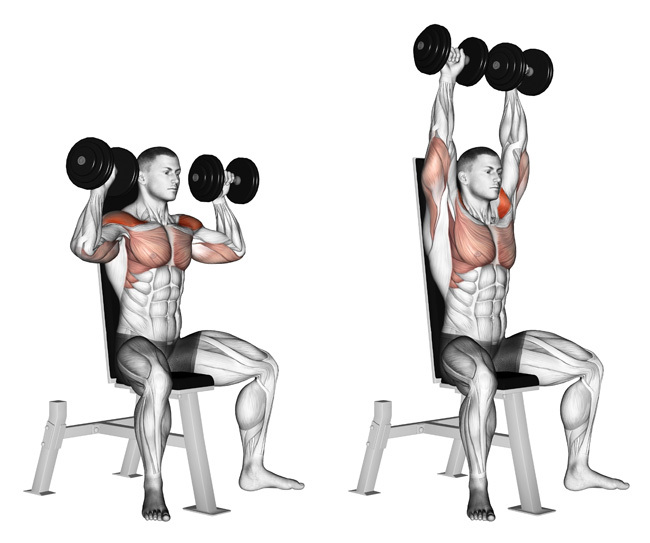 Dumbbell shoulder press is an exercise that will help increase upper body stability and strength. Start in a sitting position with your back against the support. Have a slight gap between the middle of your spine and the surface of the support. Kick your knees up to help propel the dumbbells to shoulder height. Retract your scapula before the movement. In the majority of shoulder and back exercises, retracting your scapula will allow for better support and also allow muscles to properly activate and execute movements. Press the dumbbells in a vertical motion above your head. Driving the weight upwards through your elbow joint will provide proper shoulder activation.